Two people play for £5, adult or child. Terms & conditions: Valid between 2 April and 31 October 2019. Not valid in conjunction with any other offer or promotion. Photocopies not accepted. 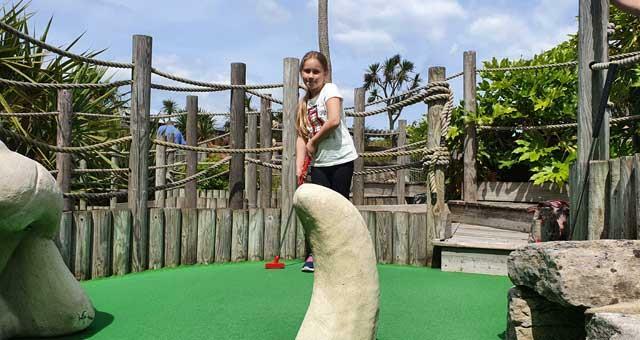 Lost World Adventure Golf in Hemsby near Great Yarmouth. A stunning 9 hole, dinosaur themed mini-golf course, with Aztec waterfall and water features. Pan for gold and receive a souvenir medallion! Fully landscaped and illuminated at dusk. Special rates for OAP's. Hot food and hot and cold drinks available on site. Member of the British Mini-Golf Association. Times may vary due to weather. Open each year from Easter to end of October Half-term. 10am-6pm off peak, 10am-10pm peak times and bank holidays.